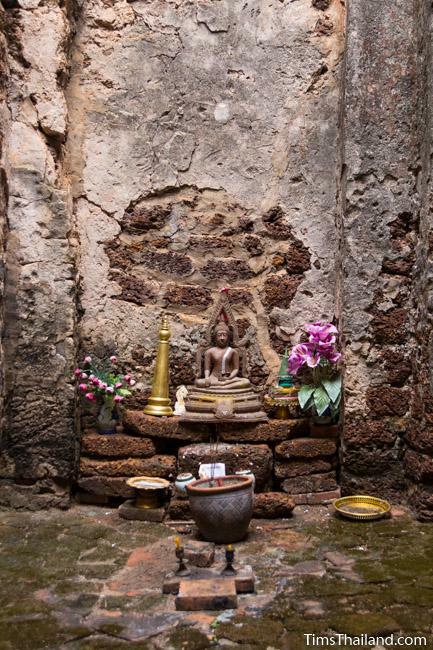 The only Khmer ruin in Phitsanulok province, Prang Wat Chulamani (ปรางค์วัดจุฬามณี) is part of its large namesake temple. It's six kilometers southwest of the modern city center near the Nan River and this was probably the city's original location. It's not worth making a long trip, but it's quite fun to visit if you're already in Phitsanulok. 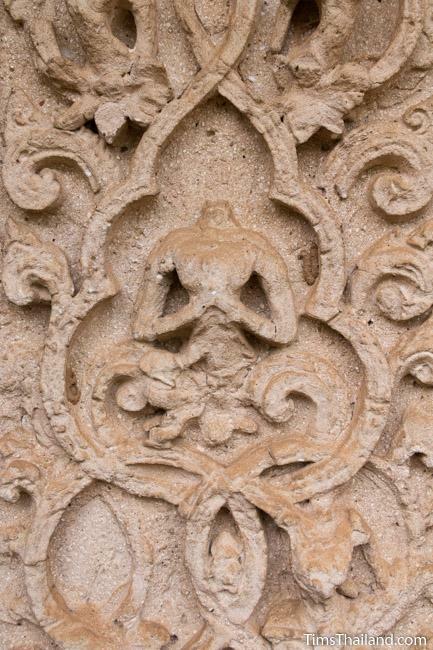 All that remains from the Khmer era is an east-facing (it's actually off from due east by 20 degrees to the south) sanctuary built entirely of laterite. 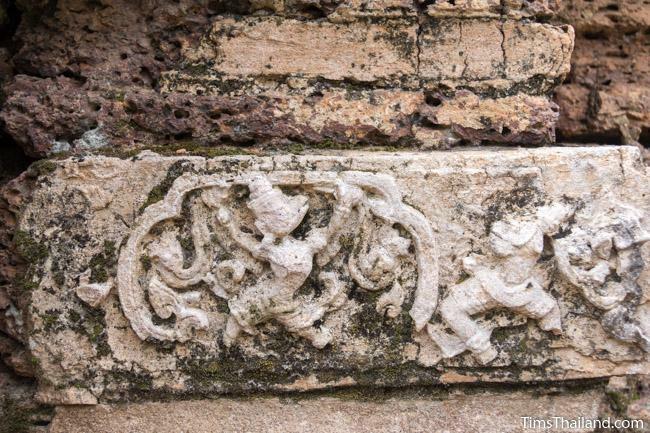 The date of construction is unknown, though the only other Khmer ruins in the area (two at Si Satchanalai and three at Sukhothai, including the similarly styled San Ta Pha Daeng ) all date from the 13th century and this one probably does too. 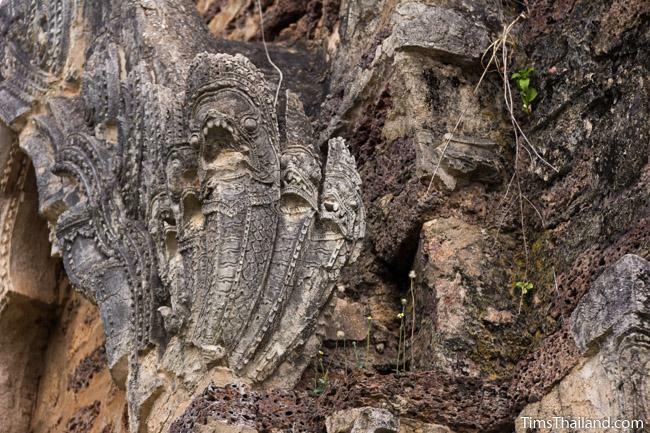 If there were any sandstone lintels or other carvings, they've been removed. The stone supports above some doors were added during restoration. The top of the tower is gone, but its lower portion and adjoining mandapa sit atop a tall base and it's quite beautiful in its decay. Staircases lead up to each of the two real and four false doors and these gives it a bit a grandeur. 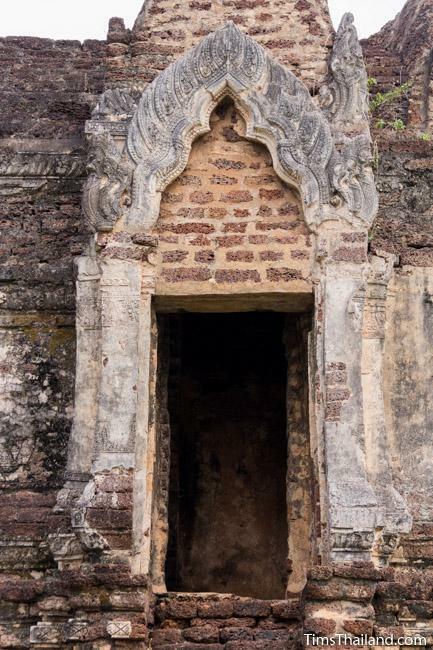 Besides the east main entrance, the mandapa has a real door on the south and a false door on the north. 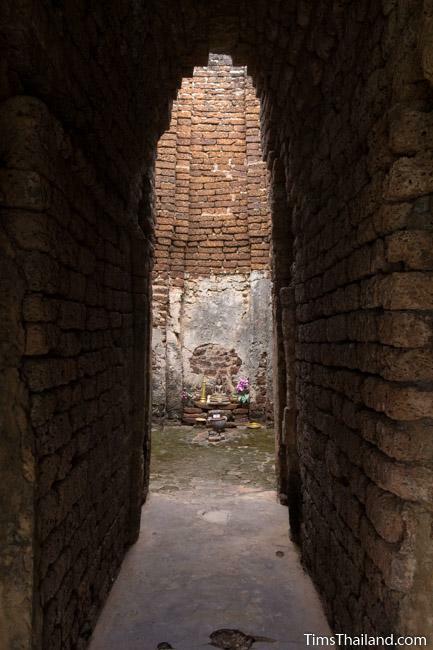 Inside, the main chamber, which has just a small modern clay Buddha (a copy of Phitsanulok's Chinnarat Buddha, of course), is reached by a tall, narrow tunnel. The shadow and sun, due to the lack of a roof over the main chamber, creates a great effect as you enter. 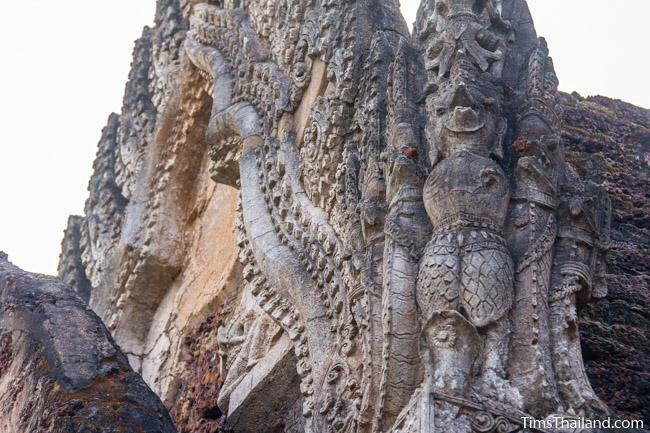 There's still a fair amount of old stucco covering the exterior – notable are a ring of swans (symbolizing heaven) around it at about floor level and garuda battling naga above the doors – though all or most of this stucco was done after the Ayutthaya kingdom took control of the area. 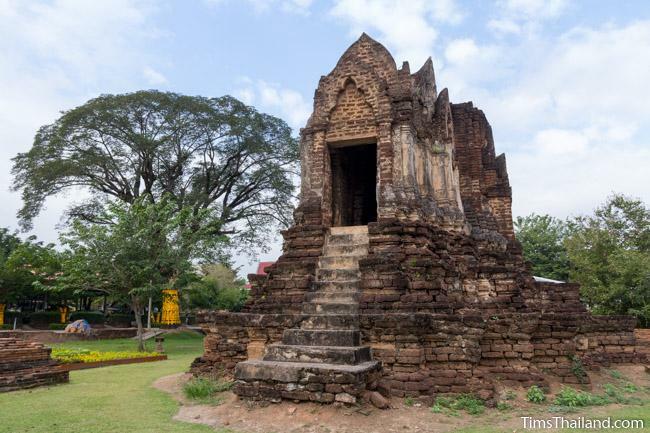 All the other ancient remains around it (a mondap, numerous brick platforms from buildings and stupas, and bai sema boundary markers) as well as the name, also come from the Ayutthaya era. 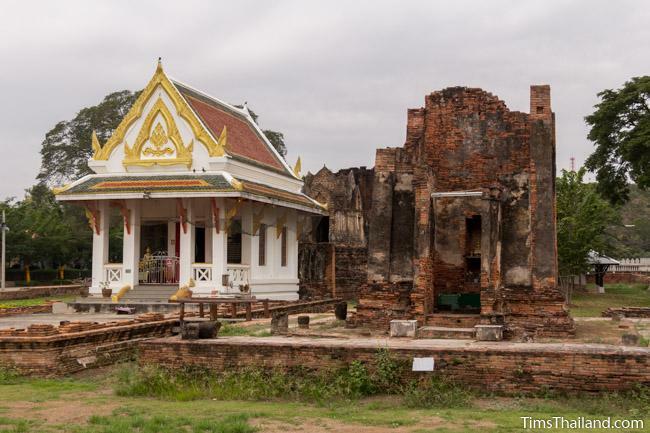 King Trailokkanat, who temporarily moved the capital from Ayutthaya to Phitsanulok, founded the temple in 1464 and then ordained here for eight and a half months along with 2,348 of his palace staff. 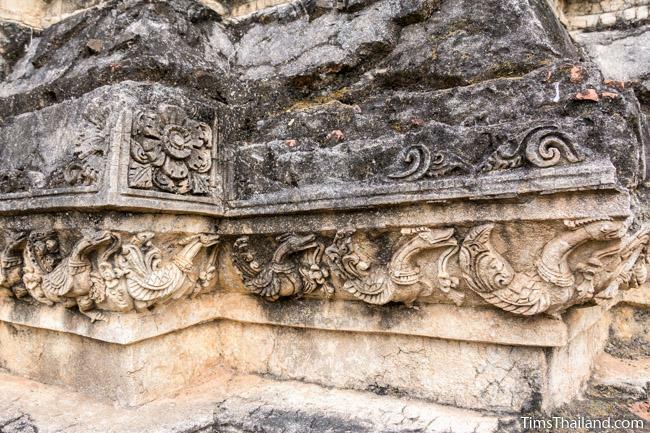 Two centuries later, King Narai carved a Buddha footprint in the mondap though now there's only a concrete marker paying homage to the original, which has disappeared. 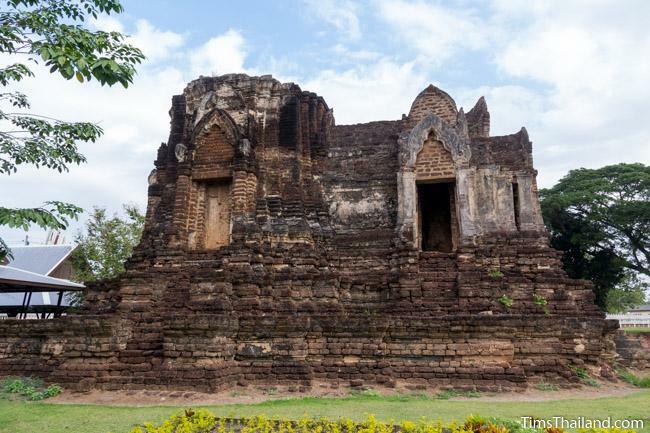 After the Ayutthaya kingdom fell, the temple was abandoned and not revived until 1930. The little modern building on top of the old Ayutthayan base was built in 1952. What’s means of Mandapa ? Hello Ratri. 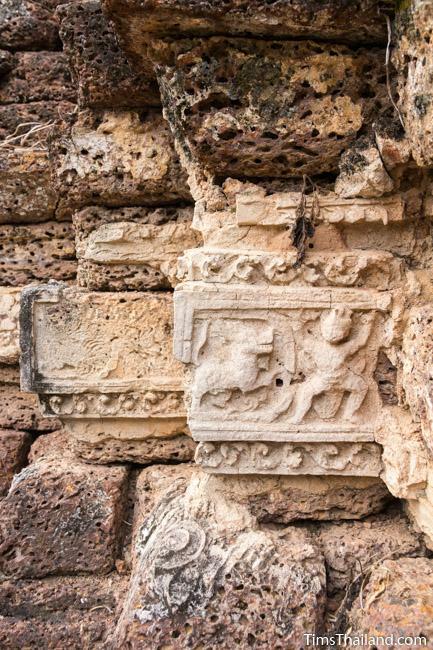 In Khmer ruins, a mandapa is the front chamber connected to the main tower. 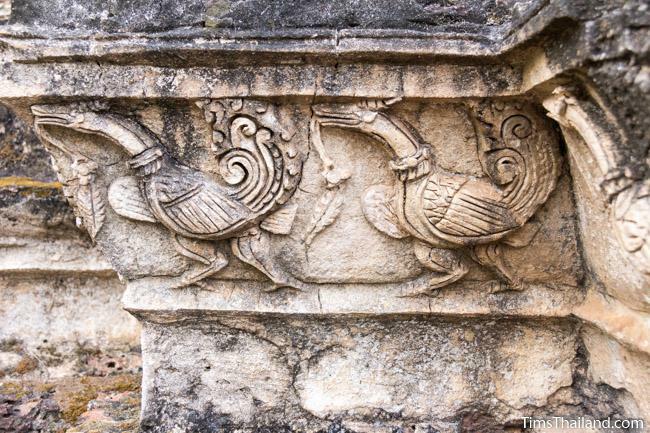 Many Khmer temples had them, but not all.